V Series motor-driven metering pumps are durable and easy to operate with a flow rate adjustment control dial at the top of each pump. An automatic relief valve operates when abnormal pressure occurs. The dust- and water-resistant body ensures durability, even for outdoor use, and the enclosure is IP65-rated for performance and durability. 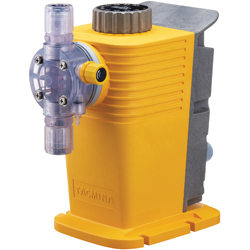 Pumps in this series include acid chemical pumps, caustic soda pumps, sodium hypochlorite pumps, boiler chemical pumps and polymer coagulant pumps.